A fresh chassis, new engines, an updated iDrive interface, and a host of innovative technologies have BMW’s 5 Series coming out swinging for 2017 in an attempt to regain the top spot in the midsize luxury segment. It’s easy to miss the changes with BMW’s tendency toward “evolutionary styling,” but in reality the 2017 5 Series is all new. High-strength lightweight materials means it grew in size but not in weight. New engines mean it increased power but not consumption. And a slight look to the past means the 5 Series just might be heading back in the direction of being a driver’s car again, even if it no longer offers a manual transmission. At first glance, the guy who rides his bike to work in your office might notice the new headlights, and that’s about it. They’re thinner now and flush with the twin kidneys, which hide active shutters to help with warm up and efficiency at speed. Look a bit harder and there’s a nice crease alongside the new 5 Series's flanks, intended to distinguish it from its bigger brother, the 7 Series. You’ll likely not notice the 0.6 inches of height or the 1.2 inches of length gained, especially since wheelbase and width have increased only marginally—just 0.2 and 0.3 inches, respectively. That is, until you get into the back seat, where all that added length went directly into legroom, increased by the same 1.2 inches. 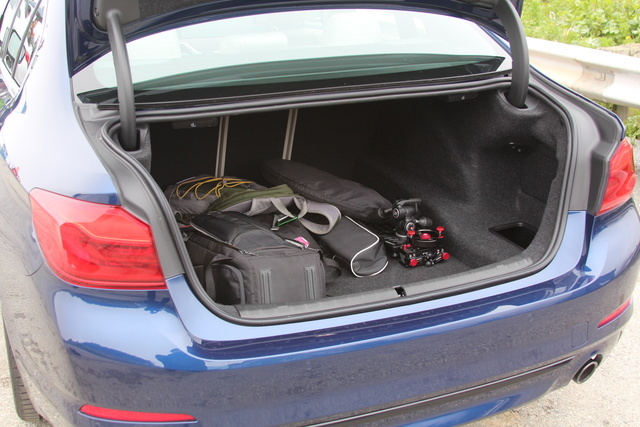 The trunk’s already impressive capacity has increased slightly as well this year, now standing at 18.7 cubic feet. The main issue with the 5 Series has been its continual and incessant charge toward luxury and away from driving feel and performance. In short, it’s gotten big and fat and numb in its old age. At the same time, it’s become a do-anything luxury car that offers just about anything else you could want out of a 4-door sedan. This year, BMW tries to turn back the clock a bit with a new chassis full of high-strength, weight-saving materials like aluminum and magnesium, adding up to a claimed weight savings of 137 pounds. Add a new double-wishbone front and five-link rear suspension setup and things are looking good in the athleticism department, but don’t start celebrating just yet. The 5 Series is also boasting a whole host of new features this year that can easily negate every one of those saved pounds, depending on how aggressive you get with the options list. With the base 530i offering an updated turbo 2.0-liter engine, you’re looking at a starting MSRP of $51,200. That’s a lot of money to pay for a 4-cylinder engine, even one as good as this—and trust me, it’s good. 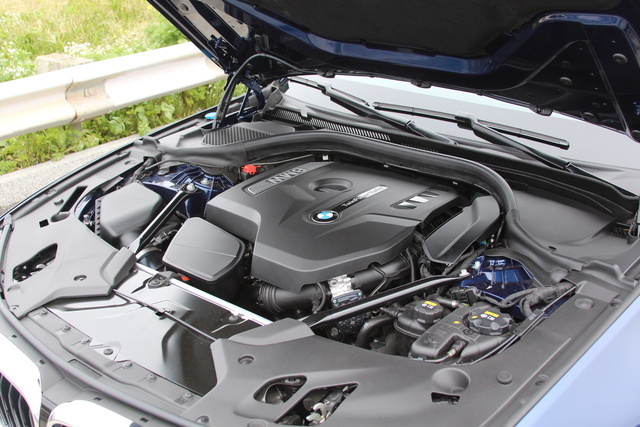 Moving up to the 540i’s turbo inline six means a $57,150 price tag, and if nothing but the best will do, the M550i offers a twin-turbo V8 for just over $72,000. But the BMW options list is dark and full of terrors, and the “base” 530i I was given to test for a week was optioned all the way up to a price tag of $72,135 thanks to fancy features too numerous to list here. Not counting included features, there are 21 paid add-ons here—everything from $600 soft-close automatic doors to $190 gesture control to $650 ceramic controls. It’s honestly shocking what BMW will make you pay for (if I’m spending $70K on a luxury car, isn’t charging me $300 for Apple CarPlay kind of insulting? ), and it seems like their strategy is to simply overwhelm shoppers with options. For those who would balk at paying $70K to get a 4-cylinder engine, turbocharged or not, the good news is this is one of the best engines on the market right now. It’s certainly the best 4-cylinder on the market, having first debuted in the 2014 MINI Cooper S and since powering everything in the BWM lineup from the 2 up to the 7 Series. Here it offers 258 lb-ft of torque between 1,450 and 4,800 rpm and 248 hp between 5,200 and 6,500 rpm. At 3,800 pounds, the 530i will jump to 60 mph in 6 seconds if you stick with rear-wheel drive (RWD). If that’s not quick enough, the 540i’s turbo 6-cylinder offers 335 hp and 332 lb-ft of torque, adding up to a 0-60 time of just 4.9 seconds. Go with AWD and those 0-60 times will both drop by 0.2 seconds—not really worth it for the speed, but those in snowy climes will welcome the added traction from those front wheels. And for speed that’ll make you reconsider your whole worldview, the M550i’s twin-turbo V8 delivers 462 hp and 479 lb-ft of torque and will hit 60 mph in just 4 seconds. That’s faster than the current M5. By nearly half a second. Of course, there’s a new M5 coming, so that detail should become obsolete very soon. For now, let’s concentrate on that turbo four. With turbo lag nearly non-existent, there are just a couple of places where the four falls short for me. At startup, it still sounds a bit rough. Things are well-isolated inside the cabin, so you'll really notice it only if you’re standing outside or sitting inside with the windows down, but that kind of mechanical inelegance is still hard to accept at $50K, let alone $70K+. Once it’s warm, it sounds smooth and pleasant, with a nice aggressive growl up through the tachometer. Performance-wise, the only place it falls flat is when passing at highway speeds. Unless you have it in Sport mode, you’ll have to use the paddle shifters and drop a few gears for instant torque, otherwise you’ll be waiting for the turbo to spool. The 540i’s inline 6 suffers from no such issue, so you’ll have to decide whether another 2 cylinders is worth the extra 6 grand. Speaking of those paddle shifters, every 5 Series comes with an 8-speed automatic transmission now. There is no manual option. Thankfully, the ZF 8-speed is well up to the task—part of the reason it has a seemingly ubiquitous presence in the auto industry. Coupled with an optional Eco Pro mode and start/stop tech, the 530i has a claimed rating of 24 mpg city and 34 highway for a combined rating of 27. My own average for the week ran closer to 22 mpg, but I turned off start/stop, never used Eco Pro, and admittedly, had a lot of fun and leaned on that skinny pedal a lot. Were economy my goal, I have no doubt a 27 mpg average would be attainable. There’s also an Adaptive mode that is supposed to detect and determine the ideal setup depending on your needs and habits. It works well, but if it were really doing its job, shouldn’t that make the other modes, well… unnecessary? That said, BMW’s adaptive drive system has always been one of my favorites, with a distinct feel in each setting. Too often I find myself in a car with selectable drive modes and I can barely feel the difference between the options. Here, that’s not an issue. A big improvement this year is in the handling and steering. Beyond the improvements in the chassis and suspension already mentioned, there’s the optional dynamic dampers and electromechanically controlled anti-roll bars. 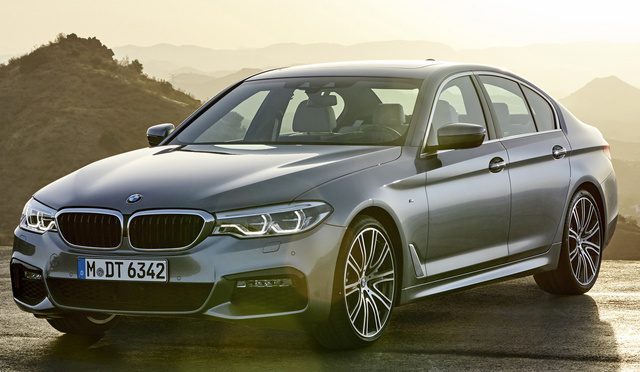 Working in concert, the 5 Series feels much more compliant over bumps and rough pavement than in the last generation, delivering comfort without sacrificing as much performance. Even better, BMW has ditched the planetary gears that caused an inconsistent steering feel and much customer derision with the sixth-gen 5 Series. For the seventh generation, BMW has followed Porsche’s lead and utilized a more elegant variable-ratio rack for a much more predictable response. The 530i I tested was fitted with the controversial Integral Active Steering—an $1,150 option that adds rear-wheel steering. With the old setup’s planetary gears, it created an unnerving, unnatural steering feel, especially at low speeds. This generation fixes a lot of that, but I still feel it’s an unnecessary bit of tech and a great way to keep the price and the weight down. After all, a base 530i might be 3,800 pounds, but it can easily be optioned up to close to 5,000, and nothing destroys performance, efficiency, and feel like weight. 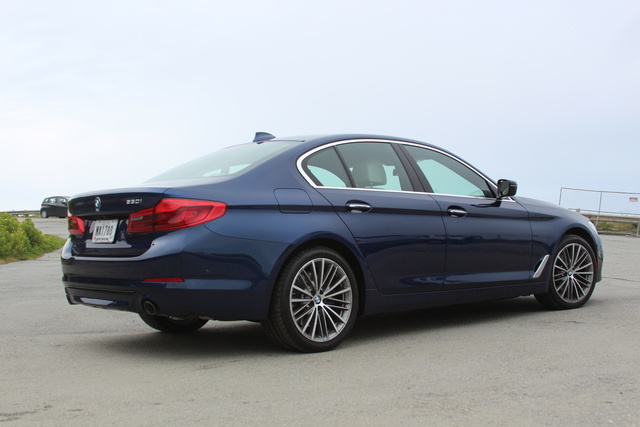 The 5 Series has become a comfortable, luxury sedan. If you want something and you’re willing to pay for it, you can have it. Let’s face it—it’s BMW, even if you don’t want something you might be forced to pay for it. But this year there’s some athleticism back in the old boy at least, and that’s something we can all appreciate. When people start talking about Cadillac producing a better sport sedan, you need to be worried. That said, let’s not ignore the luxury and comfort, because it’s there in abundance. 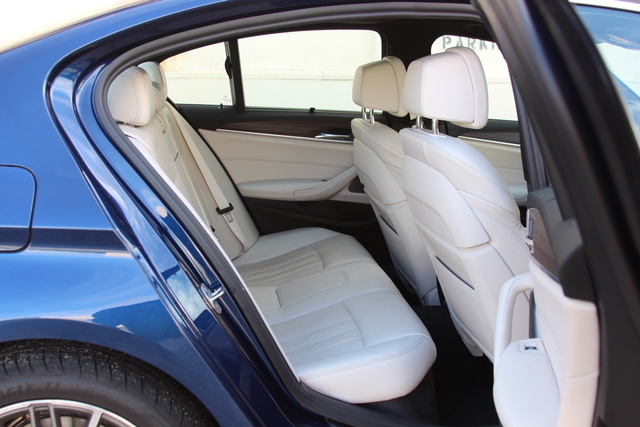 The big news is in the backseat with that extra 1.2 inches of legroom, but space is bountiful no matter where you’re sitting, and with nearly 19 cubic feet in the trunk, there’s little you wouldn’t be able to fit back there. The test vehicle I was given had been decked out in more options than I thought possible, including many that upgraded interior materials and general convenience. Ivory White Nappa leather added $1,000 to the bill. A power tailgate and those soft-close doors added $500 and $600, respectively. The “SensaTec Dashboard,” a very devious way to label vinyl, was another $500. And ceramic controls to replace some of the plastic and chrome items you’d usually find around the cabin tossed another $650 onto the pile. It’s all lovely, and there’s no arguing that it makes the interior of the 5 Series a nicer place to spend some time and eat up some miles. But I don’t think it’s unreasonable to expect a car with a starting price of 50 grand to include these things already, not to mention the insult of spending $50K+ on a car and then having to pay extra for a vinyl dashboard. Not leather. Vinyl. Let me back up a bit. Yes, I think if I’m buying a 5 Series BMW these things should be included. But here, my test version was equipped with every package available. Every. Single. One. The Cold Weather Package. The Driver Assistance, Driver Assistance Plus, and Driver Assistance Plus II Packages. The Lighting Package, the Luxury Seating Package, the Premium Package, and you’d still have to pay extra to get all the things listed above. That’s getting a little ridiculous. I understand BMW’s philosophy of offering you a basic driver’s car for the lowest price possible. I even agree with that, but at a certain point we must start talking about when exactly things get ridiculous. Financial gripes aside, there’s little else to complain about here. The driver-focused console is easy to read and reach, and everything feels well-built, well-damped, and well-placed. I do love the ceramic controls, even if I don’t love having to pay extra, and the multi-contour seats from the Luxury Seating Package ($1,600) mean it’s actually impossible to not find the perfect position. 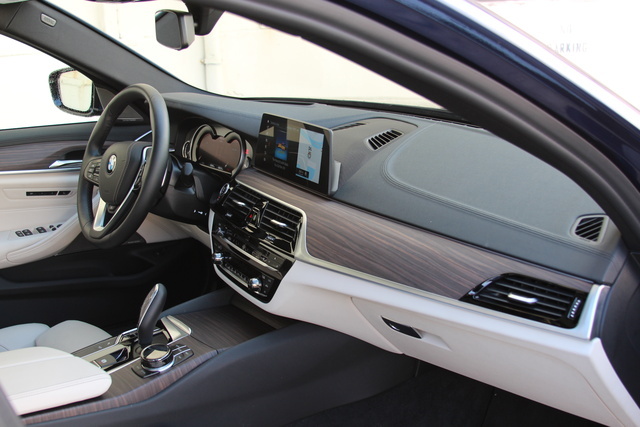 Clicking nearly every option box means this 5 Series was packed to the gills with tech, but the big news is the sixth generation of the iDrive system. Once the most maligned interface on the market, the iDrive has evolved into one of the most elegant. The issue here is really the density of information and interface options. Controlling the system involves utilizing button inputs on the steering wheel, touchscreen, rotary dial, and traditional console, and figuring out where you need to be at any given time can take some getting used to. It’s intuitive enough that you can learn on the go, so you won’t have to have to spend an afternoon in your driveway with the manual, but doing so will definitely reap benefits. 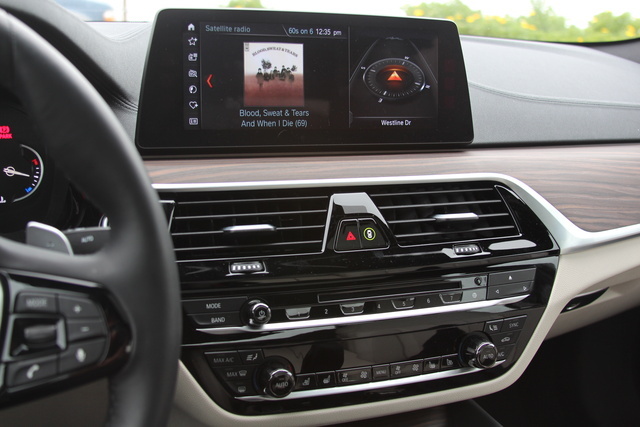 This car was also fitted with the optional, $190 Gesture Control feature, which lets you control the stereo, climate control, navigation, and even take phone calls with just a few hand movements in front of the screen. It’s interesting, but not very precise, and something I’d suggest playing with at the dealership but leaving off your spec sheet. Conversely, the 5 Series boasts the best heads-up display I’ve ever experienced, hands down. Luxury cars are currently struggling through the awkward phase of offering the driver simply too much information. Multiple screens showing nearly any metric you can think of and usually all at the same time present an anxious experience that can lead you toward forgetting that you’re supposed to be paying attention to the road. The heads-up display in the 5 Series distills all that down into a customizable and concise concentration of that informational deluge. It’s the best solution so far until car design reaches its own iPhone watershed in a couple of years. And now we come to the autonomous safety systems. The 5 Series offers every current safety system available on the market, if you’re willing to pay: blind-spot monitoring and lane-keep warning and intervention with side-collision avoidance, radar-controlled adaptive cruise, collision warning and intervention, pedestrian detection, traffic jam assistant, and automatic parking. This one had every box checked. Every time I film a review, I have to drive from Oakland across the bridge to the far side of San Francisco. It’s about a 13-mile journey of continual stop-and-go traffic that can take over 2 hours if it’s bad, and it’s always bad. With everything switched on, the 5 Series handled 95% of the chore on its own. I’m not exaggerating here. Obviously I still had to make turns, but in traffic, the 5 Series chugged along, braking and accelerating, even from a stop, all on its own. The lane-keep kept the car between the lines even on curves, and I could literally take my hands off the wheel and my feet off the pedals and just let the car take over. The only time I needed to be involved was when we’d come to a full stop for more than 5 seconds or so. Then I’d need to tap the gas to get the whole process rolling, and it’d take over again. It’s smooth, and it works, and while I have trouble believing a lot of manufacturers’ claims of having their fully autonomous vehicles ready by any date that’s less than 10 years out, suddenly BMW’s goal of 2021 doesn’t seem that far fetched. To get everything that would allow that level of autonomy, you’re talking about adding $5,000 to the purchase price, so choose wisely. Likewise, adding Apple CarPlay means another $300 on the bill, which is just astonishing. Worse, Android Auto isn't even available. This is a mistake that needs to be rectified, and fast. With the wealth of available safety features outlined above, the 2017 5 Series enjoys a 5-star safety rating from the government’s National Highway Traffic Safety Administration (NHTSA) and is a Top Safety Pick+ from the independent Insurance Institute for Highway Safety (IIHS), receiving its top score of Good in all tests. The vehicle I was given had been fitted with the optional $650 M Sport Brakes, which brought its bulk to a quick and confident stop with no drama or fade, even after multiple panic stops. 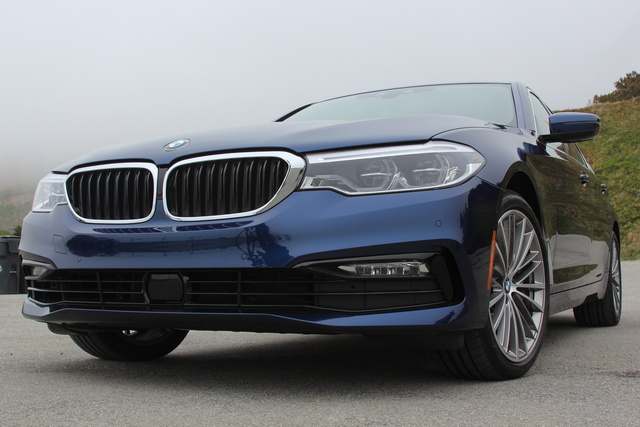 At the 5 Series’ base MSRP of $51,200, you’ll get a handsome sedan with a well-built and balanced chassis, sorted suspension, comfortable interior, intelligent and capable transmission, and one of the best engines on the market—but not much else. This is good for people who want a no-nonsense driver without the bloat of modern tech getting in the way. That said, if the convenience and fancy features are something you’ll need or want, the perceived value of the 5 Series will quickly dissipate as you tack on the options. With more than $20K worth of options on my test vehicle, I hadn’t even exhausted the list, and moving up to the higher trims means $100K is an achievable goal. Value retention here will depend on whether BMW can reclaim some of its lost glory with this new 5 Series, and so far things look good. With a new M5 on its way, we might even hear people whispering “sport sedan” again. What's your take on the 2017 BMW 5 Series? Have you driven a 2017 BMW 5 Series? Why Aren't There Any 5 Series, 535 Minimum, That Are Certified Pre Owned? 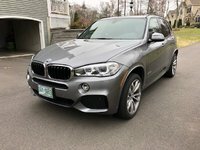 Where Is The Listing For My Car: 2017 BMW 530i Xdrive, 6,400 Miles? BMW Series 530i - RHS Exhaust Flapper Valve Staying Closed.